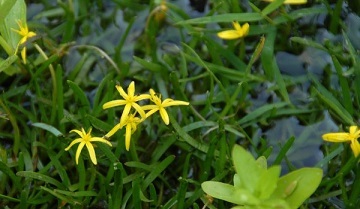 Water Stargrass has small, yellow, star–shaped flowers. The most defining characteristic of Water Stargrass is its small, star–shaped, yellow flower. The leaves are arranged alternately on the freely branching stems. They are ribbon like and are connected to the stem in a sheath. Water Stargrass can grow up to 6 feet tall and form floating colonies. Found in still, shallow water all around the United States.